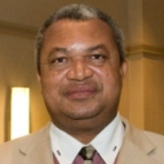 A close associate of President Sam Nujoma, Patrick Nandago took over as Namibia’s ambassador to the United States in August 2006. Previously he served as chief of protocol for the Namibian government, continuing in the position after he was named Namibia’s ambassador to Brazil in 2004. He was appointed Permanent Secretary of Home Affairs and Immigration on May 5, 2010.